India is emerging to be the diabetic capital of the world. This gives us an idea about the number of diabetic people around us. It is challenging and overwhelming to support a person with a chronic illness like type 1 or type 2 diabetes. Here are a few tips that will prove helpful. Join a Diabetes support group. Get information about it from your doctor, hospital or clinic. Get information on diabetes. You can go to www.YourDiabetesInfo.org for updates. Check with your loved one's health care team on how you can learn more on diabetes. What are those things which your loved one finds difficult to manage? What are the tasks that are easy to them? Does he/she set self-care goals to control diabetes? Does he/she keep a track of his/her goals to meet targets? Does your loved one feel low sometimes? What can you do to make him/her feel better? Remind the person to check their blood sugar at regular intervals as per the doctor's advice. Try to accompany your loved one to the doctor for all his/her appointments. Learn about the symptoms and ailments of diabetes. Prepare a plan of action in case of an emergency or if complications worsen. Help the person with diabetes to make right food choices and monitor their food intake at regular, frequent intervals. Accompany him/her to a diabetes awareness or health checkup camp. Keep a check if your loved one is following the medication prescribed appropriately as advised by the diabetologist. Keep a track of the checkups required for eye care and foot care. Motivate him/her to keep up the required level of physical activity. Make sure you have an alternate person to replace you when you are out of town. Diabetes is a chronic ailment to battle alone. Your support will make it easy for your loved one to lead a happy and healthy life. 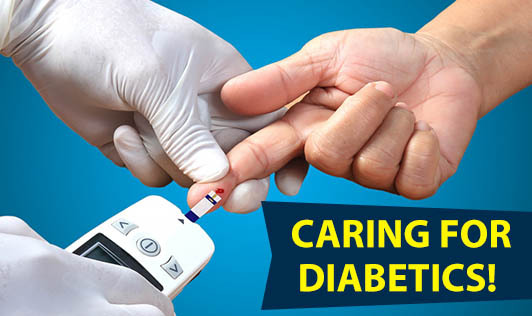 So get started today and do not hesitate to learn how to care for diabetics.